Growing up in Texas, I was surrounded by Spanish-speaking people. I suppose that’s why we had to take so many years of Spanish classes at my school. I had to take three years of Spanish in high school and four semesters in college. Luckily, I had an incredible Spanish teacher in high school. Señora Tigrett made learning a new language fun (we made piñatas and had Spanish names!) but even with a great teacher, I can barely remember the Spanish I learned. Oklahoma City has a gigantic Hispanic population. The entire Southwest side of the city is like a little Mexico—except a lot of these people are from Latin America (Guatemala & Colombia), so I guess we should call it Little Latin America. I love going down there and naming, in English, all of the stores. I suppose it is divine intervention that I live so close to the southwest side. I love Mexican cuisine. Love, love, love. I grew up on TexMex (which YES IT IS THE BEST MEXICAN FOOD) and have been broadening my taste from there. I’ve tried longaniza, lengua (cow tongue), menudo, horchata, tamarind candy (really gross, by the way), and authentic tortas since moving to OKC three years ago. So now I’m going to make mole. 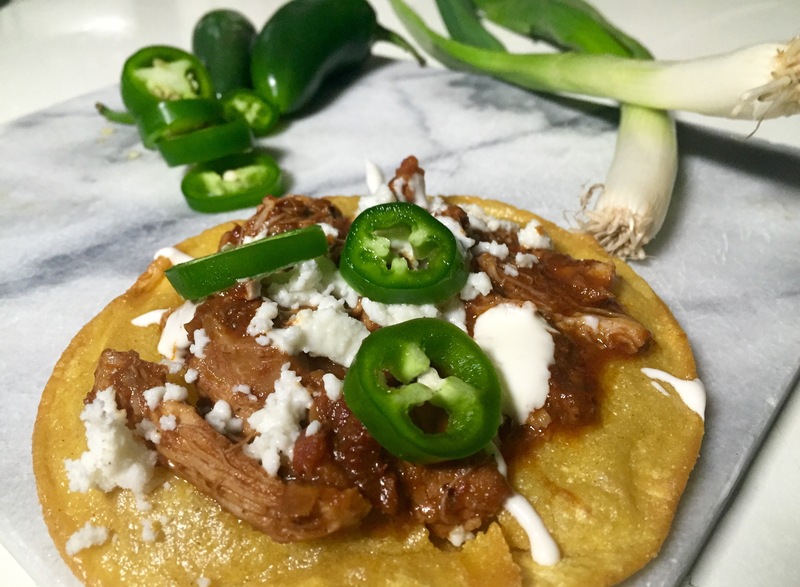 I’ve tried the jarred stuff before (it’s great), but after watching contestants make their own mole on a Food Network show a couple of days ago I decided I would make my own as well. I combined two recipes: one from Martha Stewart and one from Marcella Valladolid. 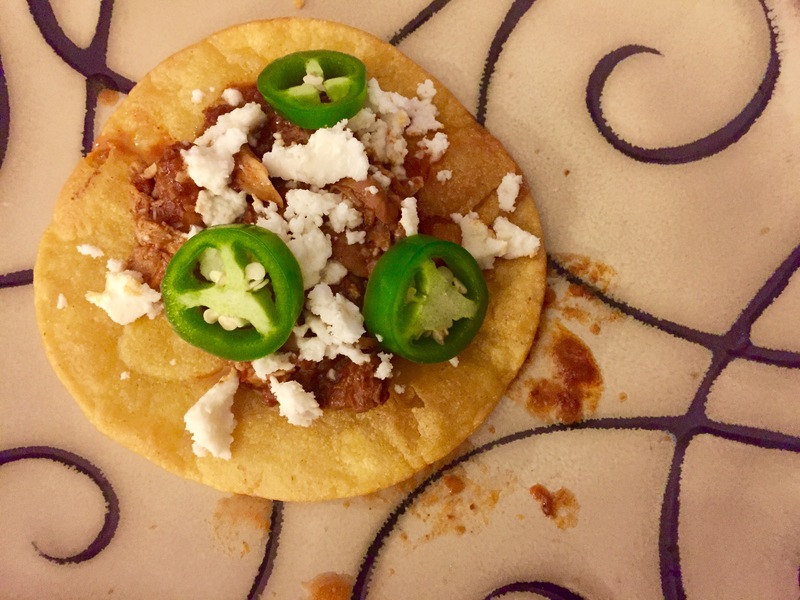 I didn’t feel like making enchiladas, so I dreamt up the tostadas idea and grabbed a few toppings from a Mexican grocery store (super mercado!) and went to work. The end result? Well, you’ll see. 1. Reconstitute the ancho chiles. 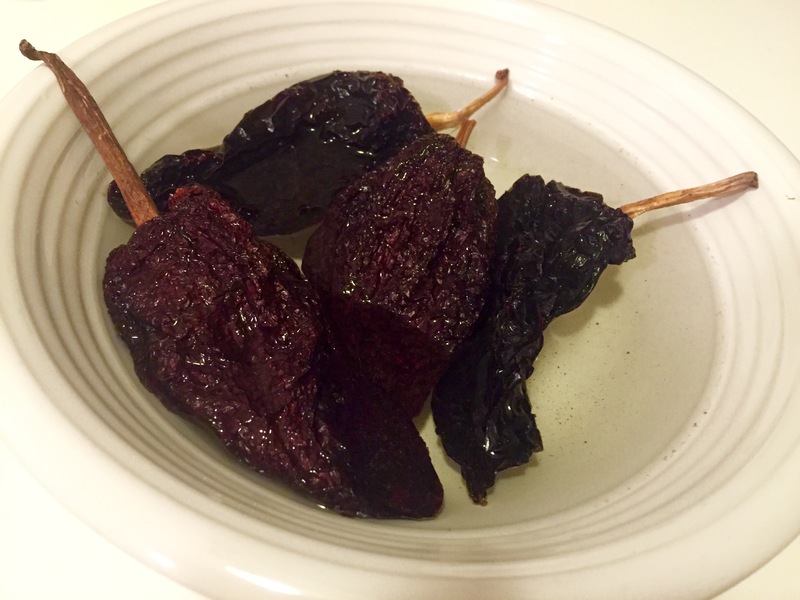 Place chiles in a bowl and cover with 2 cups of hot water. Let sit for 15 minutes. 2. Meanwhile, toast sliced almonds. 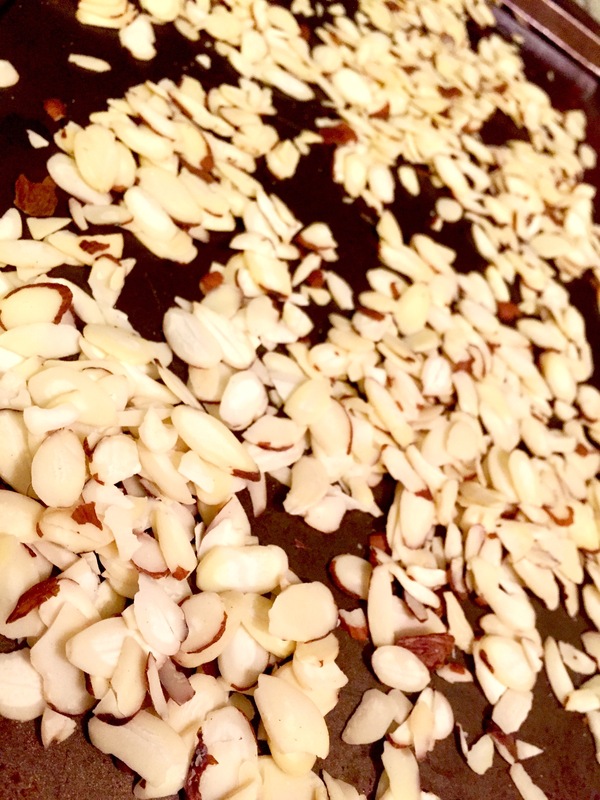 Preheat oven to 400 degrees and toast almonds for about 5 minutes on each side, until browned. 3. Now make the mole! If you have a blender, use a blender. I actually don’t own a blender, so I had to use my food processor and it spit up some stuff since there was so much in it. 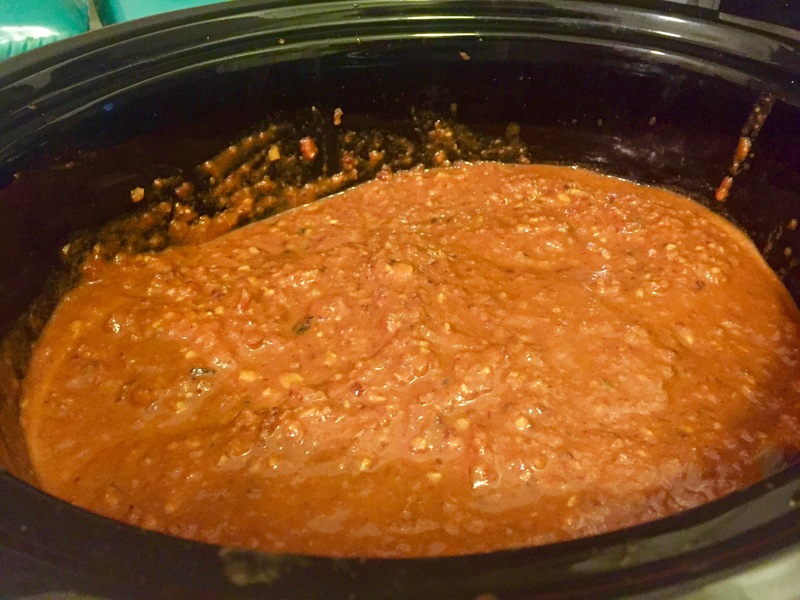 Anyway, add both cans of tomatoes, about 1 tsp of salt & pepper, can of chipotle chiles in adobo, peanut butter, olive oil, cumin, cinnamon, Mexican chocolate, garlic, onion, & toasted almonds to your blender or food processor. 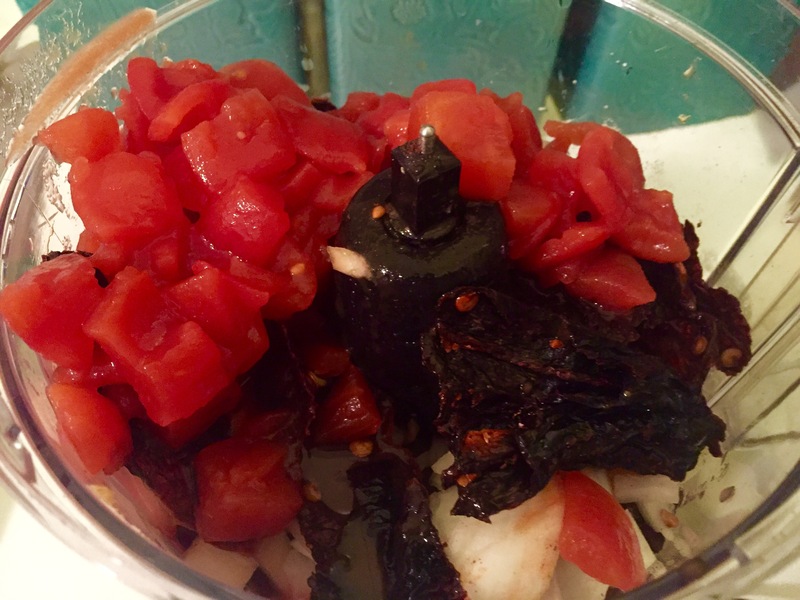 Take ancho chiles out of water and slice in half. Here’s the tricky part: if you like a lot of heat, leave most of the seeds in the chiles. If you want your mole to be less spicy, take out the seeds. I took out most of the seeds in my chiles: out of the four chiles used, I only left all of the seeds in one chile. It was the perfect blend of heat without being overly spicy. Add your chiles to the blender/food processor and pulse until smooth. 4. Season both sides of chicken with salt & pepper and place on the bottom of a legs crockpot. 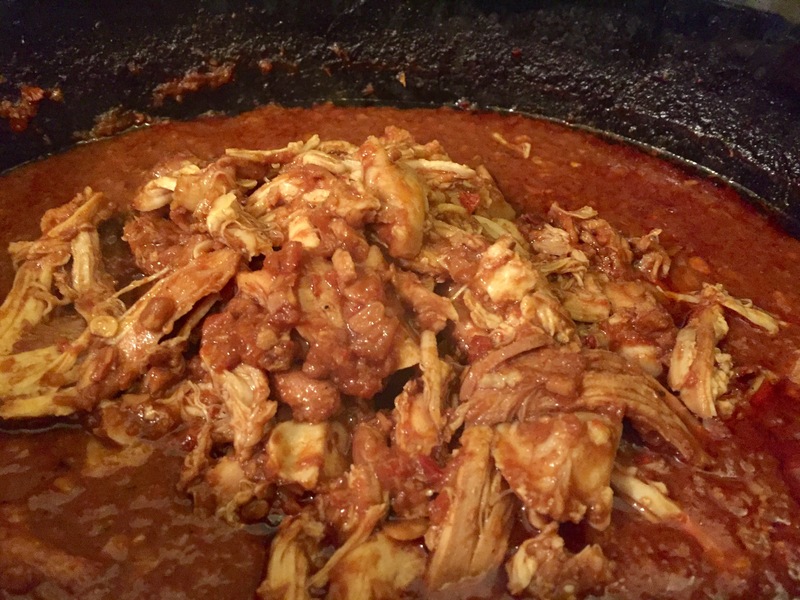 Pour mole sauce over the top of the chicken, and mix well. 5. Cook mole on low for 8 hours or on high for 4 hours. I did a mix of the two: I cooked it on low for 2 hours, than high for 2 hours, then low again for an hour. It came out perfect. 6. Take chicken out of crock pot and shred, then put shredded chicken back into the crockpot. Mix with mole sauce. Make your tostadas: fry corn tortillas in 1.5 inches of vegetable oil until crispy and golden brown. Drain on plate with paper towels. 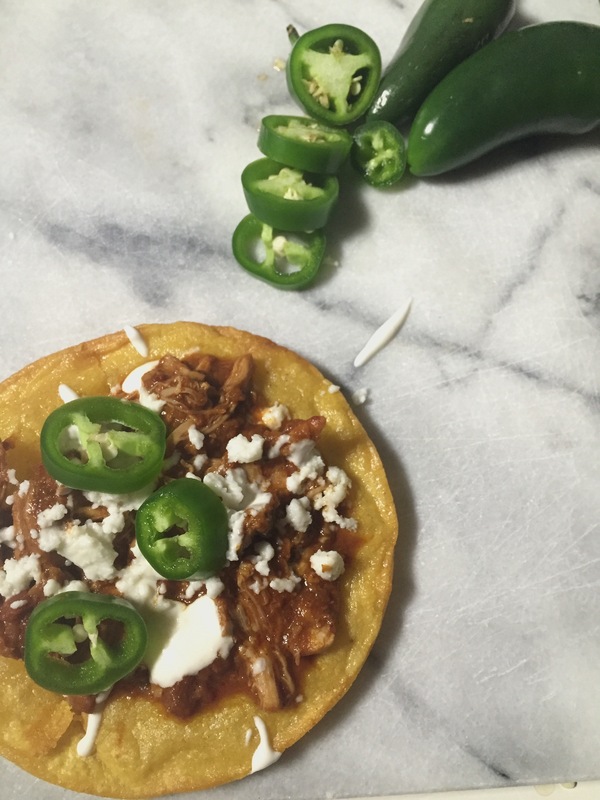 Build your tostadas: place chicken with mole sauce in the middle of the tostada shell. Top with crema, queso fresco & sliced jalapeños. Skill Level: Easy to medium, surprisingly. Mole shouldn’t scare any cook into eating the jarred variety if it’s this easy to make! 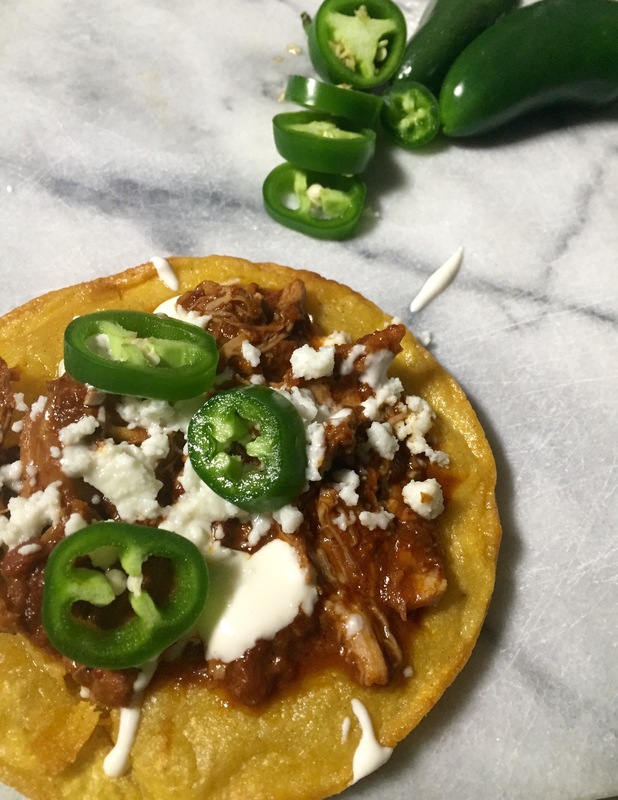 Using a crock pot definitely makes this recipe a lot easier. Just blend, top, and let cook. Flavor Profile: If you’ve never had mole before, you’re in for a shock. It’s this heavenly blend of spice, heat, sweetness, and then has undertones of a toasted, balanced flavor. Mexican chocolate contains cocoa, cinnamon & spices, so it’s a lot different than regular chocolate. Mole is to Hispanic people as BBQ is to Texans. Sweet & savory, spicy and mild. That’s where it’s at. Versatility: Like I said above, if you aren’t a fan of kick, deseed your ancho chiles. If you love hot food, leave the chiles in! Other than that, I wouldn’t change anything in this recipe. End Score: 110%. Holy Mole! This is good.